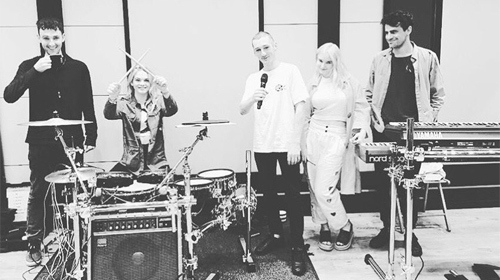 Fresh from making music with Sir Elton John, Clean Bandit - the 21st Century's answer to M People* - have hit the studio with 2015 X Factor winner Louisa Johnson (aka Louisa (aka Lousia Johnson (aka Oh yeah, her))). Don't worry, though, because Tears is much better than it sounds - a twinkly, housey, arms-akimbo banger, cut from the same cloth as Gloria Gaynor's I Will Survive. Louisa declares "I will get over you" with such conviction that you can picture her wiping away the mascara that's streaming down her face and striding purposefully into the night (with a sheet of loo roll stuck to her pants because she is just like you or me). It's not perfect. Clean Bandit's USP - they play proper instruments, you know? - is clunkily shoehorned into the chorus, giving what should be the climactic moment the ambience of "fourth runner up at Eurovision". But overall it's a solid 7/10. (If the player doesn't work try this link instead. * If the M People were a question, which is debatable.